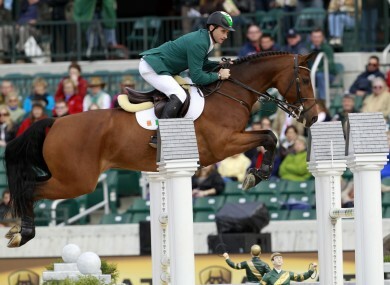 The rider was hoping to be reinstated after he was dropped from Ireland’s Olympic showjumping team. Denis Lynch on Lantinus (file photo). DENIS LYNCH’S APPEAL against his controversial displacement form Ireland’s Olympic squad has been dismissed by the Court of Arbitration for Sport. Lynch’s case was heard by an ad hoc sitting of CAS in London last night and the court released their decision this afternoon. The 36-year-old was controversially dropped from the two-man team after his horse Lantinus was deemed hypersensitive at an event in Germany earlier this month. Cian O’Connor was selected to join Billy Twomey as Lynch’s replacement in London. The team jumping competition begins next Saturday, 4 August, at Greenwich Park. Email “London 2012: Denis Lynch appeal dismissed by CAS”. Feedback on “London 2012: Denis Lynch appeal dismissed by CAS”.